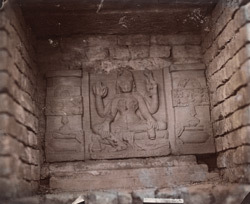 Photograph of a statue of a four-armed goddess in the court of the temple at Damdama, Hazaribagh District, taken by Joseph David Beglar around the 1870s. Damdama is located in the modern state of Jharkhand. In his Report of tours in 1874-75 and in 1875-76 Beglar wrote, "Damdama contains several mounds, yielding large 18-inch bricks. There are also several temples, and I have succeded in procuring one inscription from the neglected Argha lying in front of an old but recently repaired brick temple, which is certainly old; it reads Aum Samvat 13, Sri Pala Deva."